Above: A rendering of the new entrance to La Salle Prep's Saalfeld athletic complex. 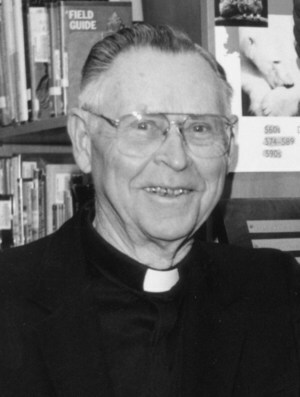 Right: Father Lawrence Saalfeld. Vancouver resident and philanthropist Elsie Franz Finley and her late brother, Robert W. Franz, have donated $1.25 million to La Salle Catholic College Preparatory, a co-ed high school of 700 in Milwaukie. $1 million will go toward expanding and renovating the entrance to La Salle’s athletic facilities to make the campus safer and more secure. The project, say school leaders, will “enhance the overall student experience” by renovating the locker and training rooms and replacing the gym floor. The balance of the gift will establish – as part of the La Salle Educational Foundation – the Father Saalfeld Endowment Fund, which will award need-based scholarships to La Salle. The first Saalfeld scholarships will be awarded for the 2018-19 school year. Saalfeld was faithful fan of the Falcons. He often came to basketball games and cheered for La Salle from the bleachers. On the Feast of St. Nick, he dressed up as Kris Kringle and walked down hallways of the school to give candy to students. Franz, who was a banking executive, and his sister got to know Father Saalfeld while Saalfeld served as pastor of Milwaukie’s St. John the Baptist Catholic Church from 1968-1983. The family got involved with La Salle when Saalfeld invited Franz Finley to join him on the school’s board of trustees. The donation came as a result of a letter Saalfeld sent to the Franz family about 20 years ago. In the letter, the priest asked the siblings to fund a new chapel for the school. In January – a little more than a year after her brother died – Franz Finley came across the letter again. Curious, she called La Salle. After learning the chapel campaign had ended, she asked if there was another way her family could honor Father Saalfeld at the school he loved so much. Yes, she was told. There was. Since growing up in Milwaukie, the Franz siblings have made an enormous impact on Catholic ministries throughout the Northwest. Their support of the University of Portland led to construction of a 78,000-square-foot academic building named Franz Hall. In addition, their gifts to the Providence Portland Medical Foundation led to the establishment of the Robert W. Franz Cancer Research Center, which has more than 100 researchers specializing in immunotherapy. The gift – the second-largest La Salle has received since opening in 1966 – means that Robert Franz, Elsie Franz Finley, and Father Saalfeld always will be part of the Falcon family.